These are extremely unique churches which are situated in Southern Poland. The two similar churches lie in two towns called Swidnica and Jawor. The name Churches of Peace refers to the end of the Peace of Westphalia in the year 1648, which marks a century long war between Catholics and Lutherans. Initially were built three identical buildings, but the one in Glogow didn’t survive. 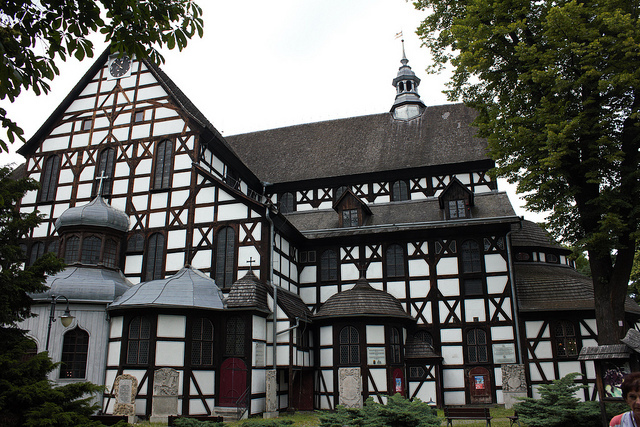 These churches are also the largest timber framed religious buildings in the world. They were built in the 16th century in the former Silesia when it was still ruled by the Habsburgs and though they were ardent Catholics they nevertheless gave an act of tolerance toward the protestant community of the region. However both of these destinations are close one to another, it is hard to visit them on the same day using public transportation. It is very close to the city of Wroclaw and also to the Czech Border. The best way to reach these destinations is by car or bus. Hourly there are buses from Wroclaw that takes you there and it is relatively cheap. These Lutheran construction are very rare examples of protestant churches that express idioms that are typical and associated with a Catholic church. Personally I consider these two wooden churches as the finest among all wooden churches of Europe and you should definitely check these places out for fine Polish heritage. Most people would not even imagine a Lutheran church like this being so decorated unlike most protestant churches which are highly simple and puritan. 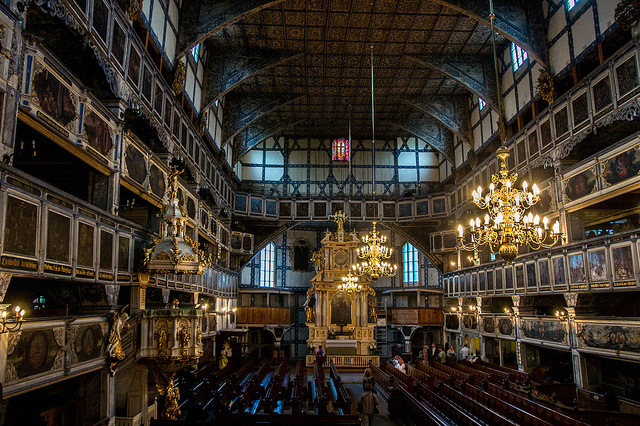 It is probably due to the catholic tradition in Poland, where very few protestant churches were built and preserved. 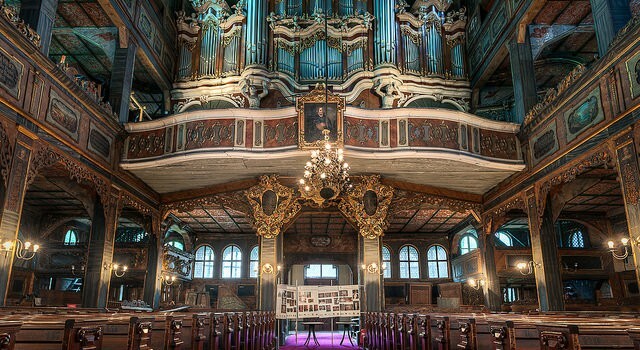 Most outstanding is the fact, that there was made a baroque style construction out of wood, with a capacity of eight thousand persons during a mass. The Church of Swidnica was built by architect Albert von Sabisch and by professional carpenters called Andreas Gamper and Kaspar Konig from 1656 to 1657. The Interior of this church is richly decorated and beautiful. It has numerous beautiful paintings and frescoes that are one of a kind and they make this church very unique. Jawor has also a charming city center with a beautiful town hall. Although I consider Swidnica more prettier but still, the historic city center must not be missed. It also has good restaurants that you might wanna try, especially traditional Polish cuisine. Like its counterpart, this church was built by the same architects yet a little – only a 2 year difference (1654-1655)- later. 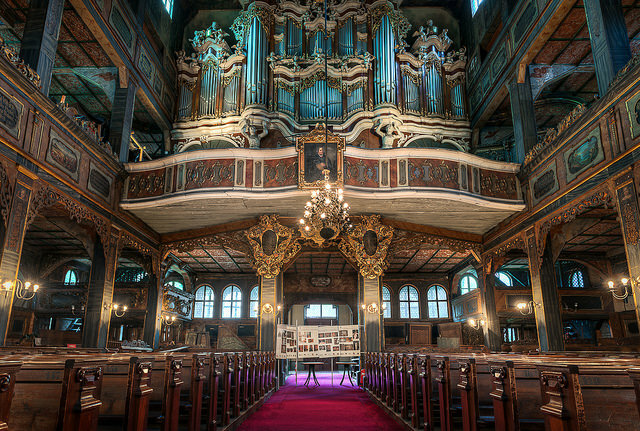 They are also known for having exceptional Baroque elements inside. Swidnica like it’s counterpart (Jawor) has also a beautiful historic city center which is worth visiting. It is not a large city but surely has everything that would fulfill your neediness. Restaurants, shops and cafes flourish one after another so there is something for everyone.